What Metals Can Be Soldered? 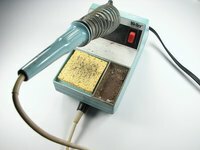 Soldering uses a metal alloy with a low melting point to join two base metals. Since this process alters the chemical makeup of the base metals, it’s helpful to know which metals work without special consideration. While silver, bronze, copper, brass and some steels form strong chemical and physical bonds on their own, metals such as high-alloy steels, cast iron, aluminum and titanium often require an alloy with a higher melting point. Soft solder uses a low-melting point metal (most often lead or tin) to make it more manageable at the expense of a weaker bond; Hard solder requires flux but forms a much stronger bond because of its higher melting point. Flux prevents the base metals from oxidizing during the soldering process. The most common solders are alloys of lead and tin, which are very difficult to use with oxidized metals; others are formulated specifically for use with these metals (i.e. steel and aluminum). Wiping solders are more fluid, making them easier to manipulate. Cable wiping solder has the highest tin content, providing a stronger bond than easy wiping solders.